People often refer to ADD and ADHD as the same thing which is, in part, correct but the two terms ADD and ADHD do apply to different symptoms. ADHD is a form of ADD with hyperactivity included in the attention deficit. The extra ‘H’ in ADHD stands for Hyperactivity. 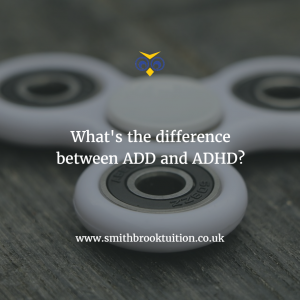 This is what people commonly think of as both ADHD and ADD, an ‘energetic, fidgety person that struggles to concentrate’. ADD without hyperactivity presents very differently, with symptoms of quiet daydreaming that can be mistaken for a shy, quiet person. What is ADHD, Attention Deficit Hyperactivity Disorder? People with ADHD can display a range of different symptoms which can become challenging to deal with, but if channelled correctly, will become an asset to life. If embraced positively, it provides people with high energy and creativity. You will regularly find that ADHD produces a charismatic personality which becomes mischievous when not engaged properly. This means that they struggle to pay attention and make impulsive, hyperactive decisions which cause disruption. What is ADD Attention Deficit Disorder? As we have discussed, ADD is similar but without the hyperactivity. ADD sufferers lose focus just as easily, but present their distraction in a very different way. A person with ADD is more of a daydreamer and, as a result, you might hear them described as ‘in their own world’. The lack of high energy and disruption means that these issues often go unrecognised. ADD still creates issues of attention when not properly engaged. Someone who you might think is just shy or quiet could, in fact, be staring off into space thinking about a completely different topic.